What’s the Deal with Sight Words? For those of you who would like a better understanding of sight words I’m happy to introduce my guest today, Margo Edwards. From the wonderful place called SightWords.com she’s here to help make everything clear. If you have a child who has reached Kindergarten (maybe even Pre-K), you have probably heard her teacher mention something about “sight words.” And you may have asked yourself why in the world your child needed to memorize these words. Isn’t she (or he) supposed to be learning phonics? Doesn’t that teach children to “de-code” the words so they don’t have to memorize? Isn’t memorization the most boring thing ever? 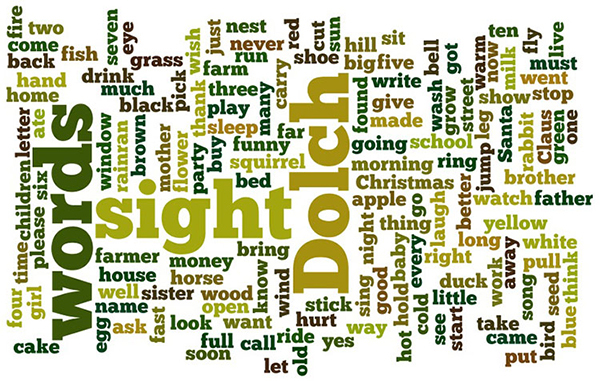 A word cloud of all the Dolch sight words. Don’t worry—the teacher is not shirking her educational duties by having students just memorize stuff. Sight words are a supplement to, not a replacement for, phonics instruction. Sight words are, in the grand scheme of things, a small but vitally important percentage of your child’s vocabulary. These words occur very frequently in the English language, words like it, can, and will. For example, the 315 words in the Dolch sight word list (taught in many American schools) include 80% of the words found in a typical children’s book and 50% of the words in an average newspaper. Also, some of these high-frequency words are phonetically irregular, meaning they don’t follow the “rules” of phonics—words like buy, talk, and come. So your child has to memorize those anyway. But even this will pay off later when she can apply her knowledge to other similar non-phonetic words, such as guy, walk, or some. Sight words are memorized so that a child can recognize commonly-used or non-phonetic words at a glance—by sight—without needing to slow down and go letter by letter. If your child has to stop and think every time she encounters one of these high-frequency or phonetically irregular words, she can’t pay proper attention to what the sentence is about. She needs to be able to recognize these words in an instant so she can focus her brainpower on more difficult words and on understanding the meaning of a sentence or paragraph. This concept is called “Learn to Read, so you can Read to Learn.” These early years of your child’s education will concentrate on teaching her to read fluently. Once she is fluent in written English, she can then focus on the content of what she is reading. Older students don’t have to think about the structure of a paragraph or sentence or how to pronounce all the words; they are instead learning the history or science being explained in the text. For an analogy, think about driving a car. You have to pay attention to several things—traffic signals, other cars, pedestrians, street signs. Now imagine that you also had to stop every few seconds and think, “Wait, which one is the gas pedal?” It’s incredibly difficult to navigate your way to a new destination if you’re struggling to remember the basics of how to operate the car. Young drivers need to log lots of practice time behind the wheel, until driving the car becomes second nature. Then they can focus their attention on getting where they are going. Likewise, sight words practice helps young readers become so familiar with high-frequency words that reading them becomes second nature. 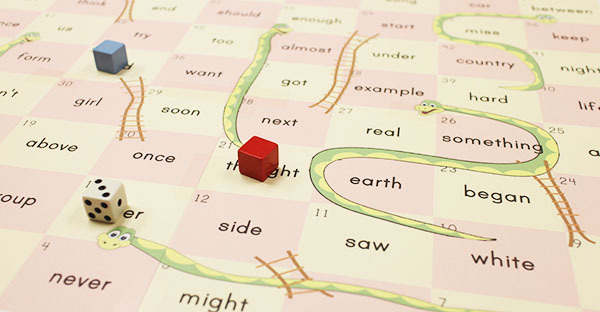 Sight Words Snakes & Ladders is similar to the classic board game Chutes Ladders. What does sight words instruction actually look like? Memorization through repetition sounds pretty boring, but it doesn’t have to be. In just ten minutes of simple lesson time, you can introduce 3-5 new sight words to your child. Then follow that with 20 minutes of playing sight words games. The games reinforce the lesson by incorporating more repetition of the sight words, but it’s disguised in a fun activity. Hopefully this has answered some of your questions about sight words. You can now take this knowledge and help your child make the most of her early education! Margo Edwards holds degrees from Rice University and George Washington University and is the Director of Content Development at SightWords.com, a website dedicated to providing free resources—from lessons to flashcards to games—to promote child literacy. SightWords.com is proud to be sponsored by the Georgia Preschool Association.